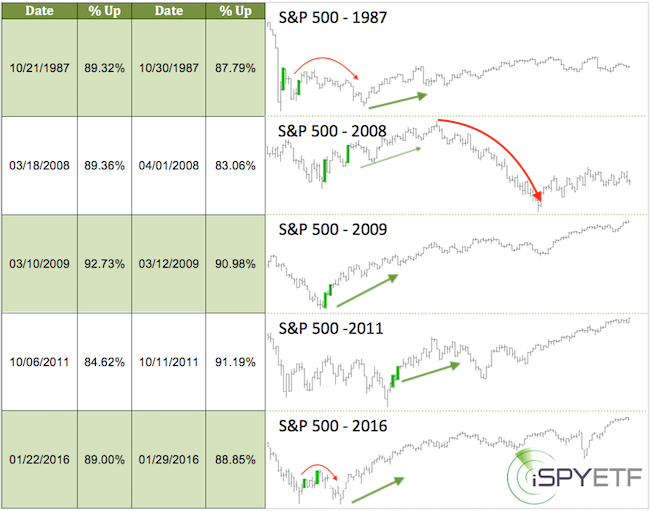 ﻿ Will Momentum Continue to Push Stocks Higher? Who would have thought that the worst December since 1931 would be followed by the best January since 1987? The 2019 rally, like the December meltdown, broke all kinds of records, but will it continue? From December 3 - December 26, 2018, the S&P 500 lost 453 points. Since then, the S&P rallied 400 points. Barron's rates iSPYETF as "trader with a good track record" and Investor's Business Daily says: "When Simon says, the market listens." Find out why Barron's and IBD endorse Simon Maierhofer's Profit Radar Report. 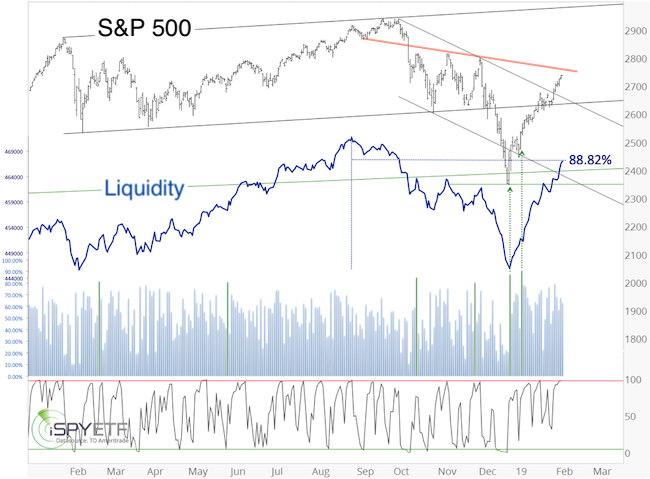 The S&P 500 ended Tuesday overbought (based on RSI-2 - bottom graph, first chart). This is not the first time the S&P has become over-bought, but in 2019 it’s been a ‘mind of matter’ pattern; As long as the market doesn’t mind, it doesn’t matter. One anomaly that also cautions against chasing stocks at this stage is the VIX. As the chart above shows, the VIX has fallen back to support around 15, in fact, it's at the lowest level since October. At the same time, the S&P 500 is still below its 200-day SMA. 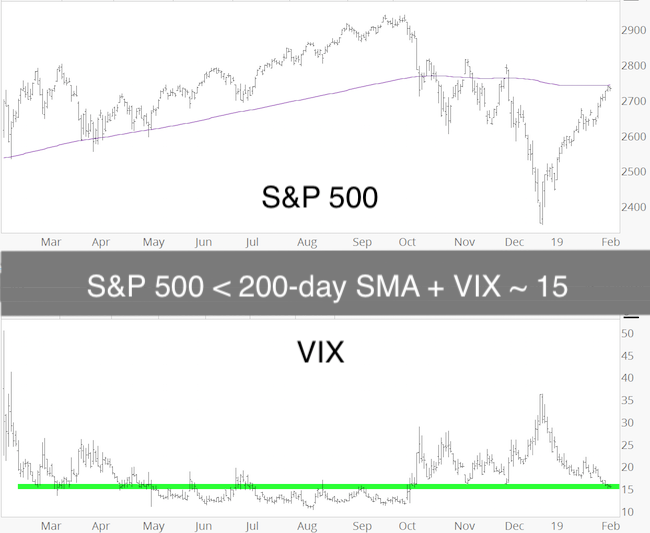 It's unusual for the VIX to drop to a 3-4 month low while the S&P is still below its 200-day SMA. In fact, over the past 20 years it only happened during the 2001/02 and 2008 bear markets. Forward returns were consistently negative. In summary, chasing stocks at this stage does not seem prudent. There should be a pullback ... and who knows, perhaps the pullback also gathers momentum. We'll evaluate when we get there. Simon Maierhofer is the founder of iSPYETF and the publisher of the Profit Radar Report. Barron's rated iSPYETF as a "trader with a good track record" (click here for Barron's evaluation of the Profit Radar Report). The Profit Radar Report presents complex market analysis (S&P 500, Dow Jones, gold, silver, euro and bonds) in an easy format. 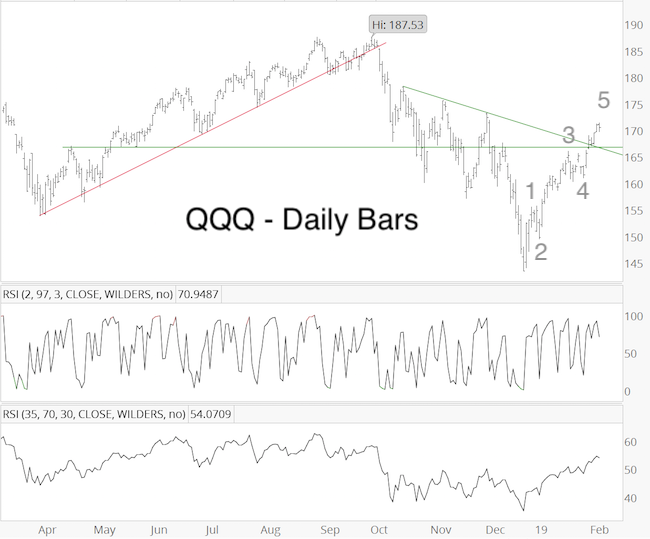 Technical analysis, sentiment indicators, seasonal patterns and common sense are all wrapped up into two or more easy-to-read weekly updates. All Profit Radar Report recommendations resulted in a 59.51% net gain in 2013, 17.59% in 2014, 24.52% in 2015, 52.26% in 2016, and 23.39% in 2017.